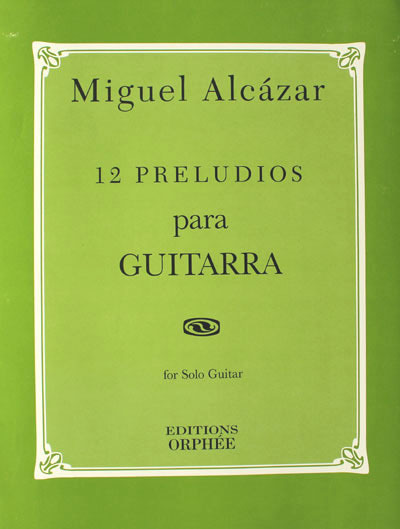 The 12 Preludios were written by Miguel Alcázar as the result of his first two trips to the Soviet Union. During the first trip, in November-December of 1983, he met Nikita Koshkin during the presentation of Alcazar's work at the Union of Composers in Moscow. A few days later, he promised to write something for him, as a way of commemorating the beginning of their friendship, if Alcazar would write also something for Koshkin. Both agreed upon this and when Alcazar went back to the Soviet Union, for the International Music Festival held in May of 1984, Koshkin gave him The Elves, a suite in five movements. The composition of the 12 Preludios was started during the Christmas vacation of 1984 and terminated by mid-January of 1985. Both works, The Elves and the 12 Preludios were premiered by Alcazar at the Ponce Hall of the Fine Arts Palace in Mexico City on March 15 of 1988.